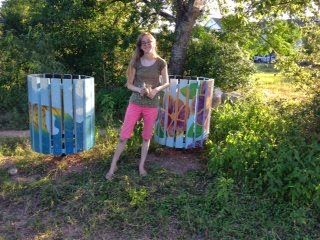 Trash cans at Blanco Shoals. Join Hunter McMain on Saturday, August 16 at 9 AM at the Hunter Road entrance to Purgatory Creek Natural Area for a short hike, light refreshments, and the unveiling of a newly placed trashcan depicting the natural flora and fauna of this natural area. The hike will discuss litter, specifically in San Marcos and its greater effects on the environment. Message from Hunter: Litter on the ground in the San Marcos greenspaces can have a negative impact on both our local and global environments. San Marcos has numerous dry creeks, especially in the green space areas. After any rain, the water flows downhill to the numerous natural tributaries that lead into these creeks taking any trash in its path with it. These creeks all flow into the San Marcos River, which eventually flows into the Gulf of Mexico, and then into the ocean. Many San Marcos greenspace areas are also part of the Edwards Aquifer recharge zone. Even the trash that may not flow into the river can contaminate the rainwater that is exposed to it before it seeps into the soil and into the aquifer. Please help our environment by disposing of your trash properly.